We acknowledge that in the absence of healthy local community development, our business would not be sustainable, let alone responsible. For this reason we devised a business model which uplifts the local Masekhane community by providing equitable employment and social support at grass roots level. 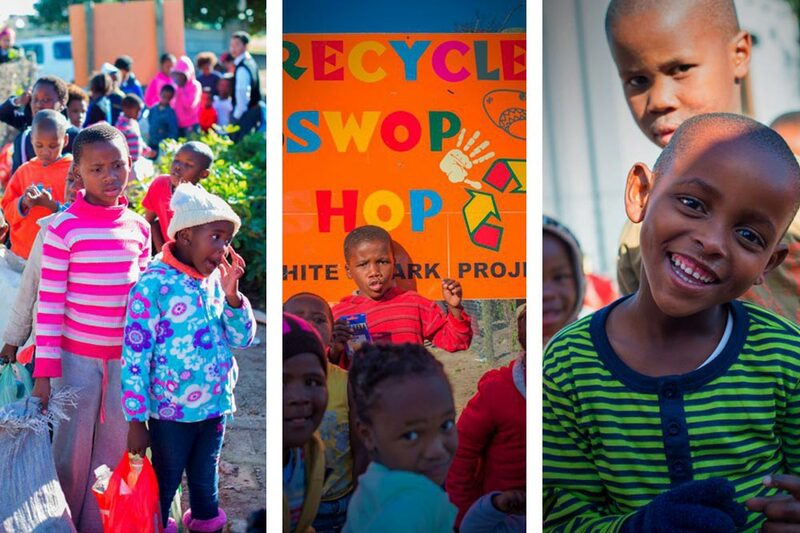 One of our more recent projects is the Masekhane White Sharks Projects Swop Shop, which trades on Tuesday afternoons and caters to the needs of children in the surrounding Masekhane community. The children collect recyclables such as plastic tins, bottles, toys, etc which earns them points. The children are then able to exchange these points for necessities such as soap, stationery, second hand clothing and food basics, plus a few toys and luxury items if they save their points till they can be afforded. The success of the initiative is evident by the queues of children who excitedly wait outside the shop long before the 2pm opening time and the delight on their faces when they leave with their precious purchases. Not only does this system provide much needed augmented support for the community, it reduces the scourge of litter and entrenches a habit of caring for the environment at an early age. In this manner, shark conservation is seen in a positive light, which ultimately results in a sense of ownership and commitment to the cause. White Shark Projects won the ‘Best Recycling Public Education Award’ with our video. The shop relies entirely on donations. You can make a difference by volunteering or by donating stock for the shop. Both South African and international volunteers are welcomed. The work is immensely fulfilling and enriching. If you would like to learn more about the Swop Shop and our volunteer programme, please contact Charmaine on 076 245 5880. Keeping the shop stocked is an ongoing challenge so donations are always welcome. The most popular items are calculators, felt pens, soap, face cloths, trousers, shorts, torches, pencil crayons, t-shirts, pens, pencils, warm jerseys, tooth brushes, tooth paste, notebooks, storybooks, and stuffed toys.